Created from the unification of Sac City Rollers and Sacred City Derby Girls, Sacramento Roller Derby combines the best skaters in the greater Sacramento region. Both teams operated in Sacramento for over ten years and have been leaders in northern California and have represented Sacramento at national and international tournaments within the Women’s Flat Track Derby Association (WFTDA). The league will continue to function under the WFTDA. Sacramento Roller Derby will maintain a 501(c)(3) status and continue philanthropic efforts within the community. Mission Statement: Sacramento Roller Derby is a 501(c)(3) charitable organization dedicated to the empowerment of youths, women, and the Sacramento community through acts of philanthropy and volunteerism, participation in public events and entertainment, and by fostering athletic competition and camaraderie in the sport of flat track roller derby at local, national, and international levels. Roller Derby was invented in 1935 by Leo Seltzer as an endurance exhibition. In 1937, Leo Seltzer re-launched Roller Derby as a full contact sport, played on a banked track with teams competing against each other for points. The original Roller Derby had its heyday in the 1950s and 60′s. The sport was a common fixture on TV and was played in sold out stadiums. The games were scripted and had the outcomes predetermind. In 1973, League owner Jerry Seltzer shut down operations due to dwindling profits. In 2001 a group of women banded together in Austin, Texas to revive Roller Derby. This version of the sport was played on a flat track and were not scripted. The sport caught on again and new players and fans flocked to the sport. 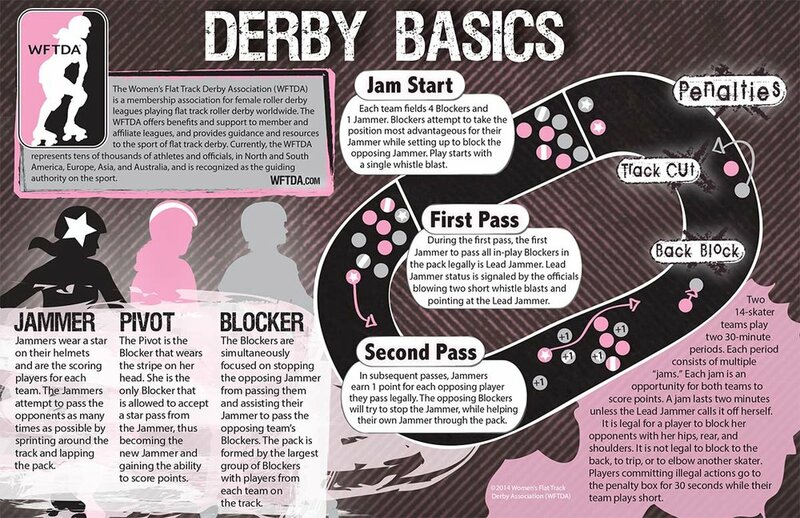 In 2004, a group of leagues formed the Women’s Flat Track Derby Association (WFTDA) which has become the premiment governing organization of the sport. The sport continues to grow each year and flat track derby is now played on every continent except Antarctica!